UNIVERSITY of Ulster spinout company Lenis Aer been recognised as one of Ireland's top innovation companies. The firm was announced as overall winner for best venture stemming from a university spin-out at InterTradeIreland's Seedcorn All-island Business Awards, held in Belfast last night. 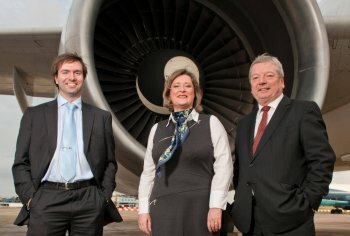 The firm developed a patent-protected process for the manufacture of aircraft engine 'lip skins', which achieve reduced turbulence and drag, resulting in considerable fuel cost savings. Accepting the award and a cash-prize of €10,000 (£8,500) on behalf of Lenis Aer at the Europa Hotel in Belfast were company directors, Edel O'Neill and Alan Leacock. Edel l and Alan said: “InterTradeIreland’s Seedcorn competition is widely acknowledged for its impact on emerging and high growth companies. The accolade follows Lenis Aer's success at the Northern Ireland Science Park CONNECT awards last month, when the firm won top prize of £10,000 from the technology entrepreneur awards. Previous finalists have gone on to secure over £109m in equity funding since taking part in the InterTradeIreland Seedcorn Business competition process. InterTradeIreland chief executive Liam Nellis said that the quality of the business plans that judges received is a testament to the innovation and entrepreneurial excellence of small businesses, North and South. "InterTradeIreland's Seedcorn competition is now in its eighth year and has grown to become the biggest business competition on the island of Ireland," he said.